Elaborate plans, including creating fake clients, were discussed hours after VBS Mutual Bank was placed under curatorship following the internal looting of R1.5bn funds, it has been alleged in court papers. 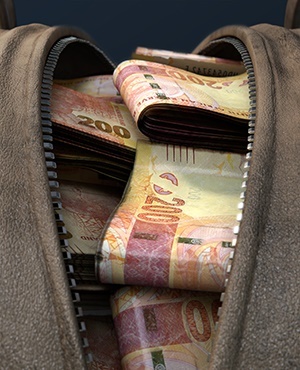 This did not work out because of fears of being found out, and in previous dealings, an oversized suitcase stuffed with R5m cash - alleged bribe money intended for an executive at the Public Investment Corporation (PIC) - formed part of the apparent plan to urgently get hold of masses of money. These shocking claims, including that the cash was transported in a helicopter purchased by VBS, a purchase which has not been accounted for in the bank’s books, are contained in an affidavit by Phophi Mukhodobwane, its general head of treasury and capital management. VBS was placed under curatorship on March 11 and SizweNtsalubaGobodo Advisory Services (Proprietary) Limited, represented by Anoosh Rooplal, was appointed to deal with this. “The bank has been the victim of a large scale fraud that has caused the bank a loss in excess of at least R1 521 925 280.46,” Rooplal said in court papers dated last week. It has so far surfaced that some of the bank’s executives allegedly helped themselves to the money, using it to fund lavish lifestyles and purchase luxury vehicles. Barely a month before the curatorship was announced, the South African Reserve Bank’s deputy governor, on April 13, appointed Advocate Terry Motau SC to investigate what had transpired at VBS. Werksmans Attorneys was also appointed to assist with this investigation, which is ongoing. On Monday SARB governor, Lesetja Kganyago, announced that more than 20 000 depositors of VBS would receive their monies as long as the money deposited to the bank did not exceed R100 000. A post on VBS’s website says: “As per the South African Reserve Bank (SARB) press conference held on 9 July 2018, all transactional retail depositors, which include individuals, stokvels and burial societies who currently have up to R100 000 deposited in VBS Mutual Bank, will have their funds transferred to Nedbank. On July 24, in the Johannesburg High Court, VBS plans to apply for an order to see that Robert Madzonga’s estate is placed under provisional sequestration. Madzonga is the bank’s previous chief operations officer. Provisional sequestrations will also be brought against Tshifiwa Matodzi, the former chair of VBS’s board of directors and also the director and chairperson of Vele Investments, and Malusi Ramavhunga, VBS’s chief executive officer, as well as Phillip Truter, the chief financial officer, and Mukhodobwane. The alleged fraud had involved Vele Investments, which is VBS’s main shareholder, and an application by VBS to try and have Vele placed under final winding-up is set to go ahead. In an affidavit, dated May 22, Mukhodobwane provides a glimpse into alleged underhanded activities carried out by high-ranking staff at VBS. “As things got desperate especially after the announcement of the appointment of a curator to VBS on 11 March 2018 Matodzi scheduled a meeting at my residence in the evening of 12 March 2018,” Mukhodobwane said. He, Matodzi and two others were present at this meeting. “The purpose of the meeting was to try and get the companies required to be used for the creation of fictitious contract finance clients,” Mukhodobwane’s affidavit said. One of the two others at the meeting introduced Mukhodobwane to someone named Romeo “who I was told would be responsible for creating the companies that would be used”. The next day Romeo, according to Mukhodobwane, was paid R80 000 in cash for this. Matodzi, Mukhodobwane said, had instructed that the contract finance clients be created as soon as possible. On March 13 Mukhodobwane said he was worried that the creation of these clients would lead back to him. “This lead to the creation of fictitious contract finance clients being cancelled and replaced by an attempt to write a loan to give to Vele a blanket revolving facility in region of R1 500 000 000.00,” (sic) Mukhodobwane said. The loan agreement was drafted on the evening of March 13. “Post the agreement being finalised it was shared with Matodzi who then refused to sign the agreement as he was fearful of the implications this agreement could have on him,” Mukhodobwane said. On March 23 2017, Mukhodobwane received an email from Matodzi. This was sent to his private inbox. Attached to the email was a quote for a Bell 222 helicopter which was being sold for R12 825 000. “Matodzi then called me on my cell phone and instructed me to make payment for the helicopter,” Mukhodobwane said. On April 7 2017, Mukhodobwane had been driving to Venda for a funeral when Matodzi had called him and instructed him to make a R5m cash withdrawal. Mukhodobwane had then contacted VBS’S Makhado branch manager who arranged for the cash to be delivered to that branch. The cash arrived on the morning of April 8 and was withdrawn from four different accounts. “I had to purchase an oversized suitcase at nearby shops in order to try and conceal the cash,” Mukhodobwane said. Matodzi then had a Bell helicopter fetch Mukhodobwane from a small airport in Makhado and it then flew him to Lanseria where Matodzi met him. “I asked him what the money was for and he advised me that the funds were intended for a senior executive at the PIC,” Mukhodobwane said. Mukhodobwane’s affidavit also delved into several other sensational claims. It said that he had been instructed by Ramavhunga to speak to another individual about R1.5m that was needed to pay other individuals because they were working to ensure that the Passenger Rail Agency of South Africa (Prasa) placed R1bn with VBS. Mukhodobwane said Ramavhunga’s words were that the R1.5m was to “unlock the Prasa deal”. The R1.5m payment was made, according to Mukhodobwane, however Prasa never placed the R1.5bn with VBS. An affidavit by Rooplal, dated July 5, said that payments to officials in municipalities, the PIC, as well as Prasa, could be described as bribes. “At the starting-end of the illicit fraudulent scheme of looting VBS and to make actual money available, the perpetrators solicited large deposits from organs of State and State-owned enterprises through the payment of bribes,” he said. In March 2017 this Robvet account had an overdraft of more than R8m, but on that same day “fictitious entries” were made and the account later had a “fictitious credit balance’” of more than R1.5m. Rooplal alleged that Matodzi was the kingpin in the scheme. “Matodzi, as the main architect of the fraudulent scheme… ensured that he, personally, and Vele in which he served as a director and chairman, benefited the most from the fraudulent scheme,” he said. Rooplal said that on October 5, 2017, a “fictitiously generated deposit of R350m was created” in the account of Vele, which was a client of VBS. The same day that the account was created, Matodzi and Mukhodobwane held a meeting in Sandton where Mukhodobwane was instructed to pay bonuses. This included R18m to Matozi, R15m to Ramavhunga, R10m to Mukhodobwane and R5m to Truter. “In light of the numerous fraudulent transaction that were processed by the perpetrators through the fraudulent scheme, it can be inferred that any ‘bonus’ payments made by Vele were, similarly underpinned by fraud,” Rooplal said. Two managers would manually create the illusion of deposits being made into VBS. VBS’s electronic accounting system was used to create fake general ledger entries which reflected apparent deposits into VBS bank accounts created by those behind the entire scheme. These apparently deposited funds would then be transferred from a VBS “suspense account” to another VBS account held by one of them. This money, though, was made up mostly from deposits held by the bank on behalf of local municipalities and members of the public.